Our skin is vital to the way we look and feel and when we start to see the effects of ageing it can be troubling. Certain skin conditions can also affect our wellbeing and self-confidence. Sometimes invasive treatments aren’t the answer and we look for effective treatments to restore our skin’s vitality and glow, without the need for anaesthetic or lengthy downtime and side-effects. At The Spa at Bedford Lodge Hotel, we have carefully chosen effective, non-invasive, device-led treatments so that you can not only enjoy your experience with us, but receive superb, long-lasting results. 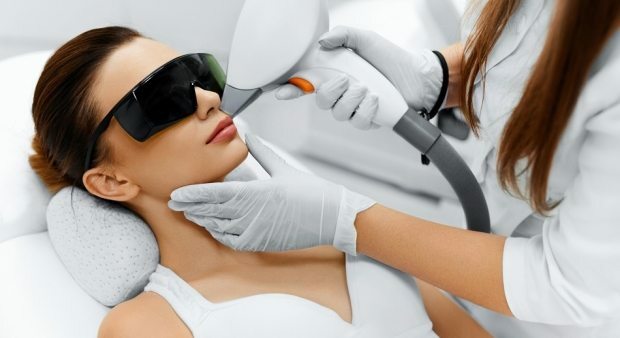 IPL (or Intense Pulsed Light) is a highly versatile laser treatment which filters light from different parts of the spectrum, treating variety of concerns from skin ageing to excess unwanted hair, permanently. The device hand-piece is placed on to the skin and the light wavelength selected for your specific skin concern; treatment is virtually painless. A course of treatment is recommended for optimum results. After the recommended number of treatments, you can enjoy an 85-90% permanent reduction in hair growth. *A course of treatment is required. 2 courses may be needed on some skin/hair types. How do I know if I am suitable for IPL for Skin Rejuvenation? Generally, skin-types from fair to Asian skins would benefit from IPL. For very dark, African skins it is not recommended as IPL emits multiple wavelengths. Prior to any non-surgical treatment here at The Spa at Bedford Lodge Hotel, we request that our clients attend an initial consultation to ensure they are medically fit and to discuss with the practitioner, their suitability for treatment and likely results to be obtained. Depending on the area to be treated, IPL can take between 30 and 90 minutes. You may feel some warmth and a slight flicking sensation, but IPL should not be painful. A cooling device is sometimes used to aid any discomfort. This all depends on your individual concern and will be discussed in your consultation with your practitioner. How long do the effects of IPL last? Many results can be permanent; however, IPL will not prevent conditions such as hyperpigmentation or Rosacea re-appearing. Your practitioner can advise you on further maintenance and prevention. There is no downtime with IPL. You can return to your daily activities, immediately following treatment. You will need to avoid sun exposure for 24 to 48 hours as your skin will be sun-sensitive. Wear a high factor SPF and stay hydrated with water. You will be advised on skincare to use at home. Our Spa is located in Newmarket, Suffolk and just a short drive from Cambridge and Bury St Edmunds. For more information on IPL laser hair reduction and facial rejuvenation and to arrange a consultation, please call us on 01638 676130.